What is an Oblate? Oblate News Becoming an Oblate Why am I an Oblate? Have you heard the word "Oblate" mentioned from time to time at Glastonbury Abbey and didn't know what it meant or who was involved? Oblates are lay women and men who have chosen to integrate their prayer, work and family life with their Christian journey according to the principles established by St. Benedict some 1500 years ago. Oblates remain active in their local parishes and Christian communities and are encouraged to lead by example in order to strengthen the spiritual experience and invigorate the entire community. 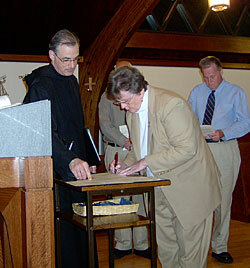 Oblates of St. Benedict include all Christian denominations and exemplify Christ in present-day society. Our Glastonbury Oblates come from eight states including all six New England states. This tradition includes practices of the Work of God (Liturgy of the Hours), Lectio Divina, community, the Word of God. Oblates become affiliated with the monastery and join with the monks in their prayer and spiritual life. Oblates strive after stability and fidelity in their lives by regular worship with other Christians and by the support they may continue to give to the social and educational apostolates of the Church as a whole. In accord with the teaching of Benedict, Oblates practice moderation. This moderation manifests itself in the use of the goods of this world, an increasing concern for their neighbor, and in the way, they temper and directs their desires. Their fidelity to Christian living will provide a much-needed example of genuine Christianity and a stabilizing influence for good within their communities. In the spirit of the Gospel, Oblates commit themselves to a continual conversion to Christ. They see sin and any attachment to it as basically incompatible with a serious following of Christ. Through this deepening of the Baptismal promise, Oblates are free to put on Christ and to allow him to permeate their lives. In this way, Oblates will come to recognize that in all the phases and events of their lives, in their joys and successes as well as in their sorrows and disappointments, they are in close union with Christ and participate in his very death and resurrection. This "putting on of Christ" is the goal Oblates pursue in their conversion of life. In the spirit of obedience, Oblates strive to discover and maintain their proper relationship with God, their family, and the civil and religious society in which they live. Before God, Oblates must come to recognize themselves as creatures dependent on their Creator and as sinners before their Redeemer. Aware of their own spiritual poverty and need of God, Oblates come to realize that they have no other reason for being, except to be loved by God as Creator and Redeemer, and to love and seek him in return. In loving obedience to God's plan, Oblates will develop a deep reverence for life. They will respect it as a precious gift from God and defend those groups that, because of age, health or race, are defenseless and most open to attack. Seeking harmony and integrity of life, they perpetuate and enhance the traditional Benedictine motto: Peace. Personally and together with other Christians, Oblates work to promote Christian family living. They take care to seek out opportunities to practice charity and warm hospitality to those around them. Oblates of St. Benedict are women and men who have formally associated themselves with a community in order that they may experience a reciprocal relationship with the community. Oblates are associated with the monastic community in a bond of prayer, love and commitment only. Oblates bring a spiritual strength. Oblates and the community provide mutual affirmation of the commitment to the Benedictine way of life. The community is enriched by the interaction with Oblates. Oblates bring culture and insights (and expertise in many areas) to the community. Oblates can serve as a link between the community and the world. The witness of the Oblates living Benedictine charisms in the secular world strengthens community members' love and appreciation for the Benedictine way of life. Oblates are committed to their monastery, its values, its culture and its prayer life. For inquiries, please email: oblates@glastonburyabbey.org and a Steering Committee member will get back to you. Oblates meet the first Tuesday of every month August through June starting with Compline at 7:15 PM in the Abbey church, followed by our 7:45 PM meeting at the Morcone Center. The September meeting is the official start of our new year. During Compline, we celebrate new Novice commitments, new Oblates making their Oblation and current Oblates making their yearly renewal.